The 2017 Honda Fit is in stock now here at Brilliance Honda of Crystal Lake, just a short drive from Elgin, IL. If you’re looking for an efficient and affordable subcompact car, then the Fit should be at the top of your list. The Fit LX is actually the most affordable and most efficient member of the Honda Fit lineup, so read on if those are your top priorities! The Honda Fit comes standard with a 1.5L four-cylinder engine in all trim levels, and here it’s paired with either a six-speed manual transmission or a continuously variable transmission. The Honda Fit LX earns the best EPA estimates in the Fit lineup. The Fit LX with manual transmission reaches an EPA estimated 29 mpg city/36 mpg highway, while the CVT earns the Fit an EPA estimated 33 mpg city/40 mpg highway*. 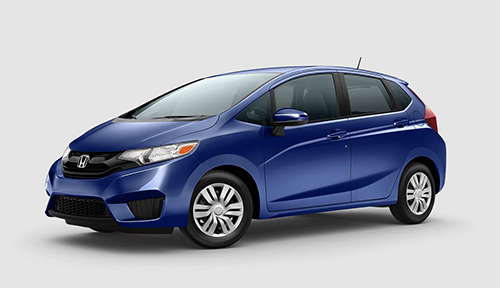 The Honda Fit is offered with many important safety and security features. Standard equipment includes front side airbags, side curtain airbags, and adjustable head restraints. The Fit also gets stability and traction control, as well as anti-lock brakes, and a rearview camera. In testing by the National Highway Traffic Safety Administration, the Honda Fit has achieved the best 5-Star overall crash test safety rating*. You can visit Brilliance Honda of Crystal Lake at 680 W. Terra Cotta Ave. in Crystal Lake, IL to test-drive the latest Honda Fit. The Fit is available in several trim levels, so contact us today to find the right version of this versatile small car for your needs.